4 Checks per Page, 4 up Blank Check Paper. For use in conjunction with Versacheck (check printing software) and many other software packages (check your perforations). 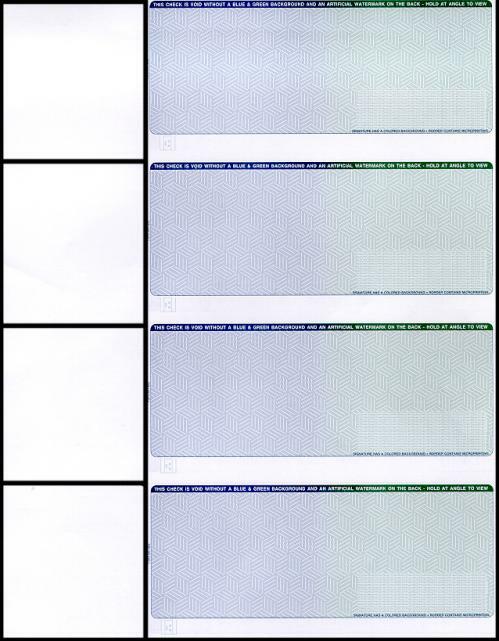 Premium Check Paper 4 Personal Checks per Page. 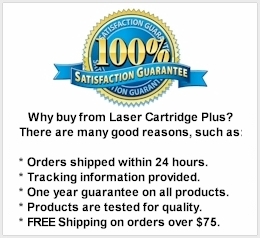 Most HP (Hewlett Packard) LaserJet printers can be used as a laser check printer. All you need is a MICR cartridge, check paper, and check printing software. You will be able to print check stubs, voucher checks for VersaCheck, and many other check software applications. This four checks per page, blank check stock delivers excellent print value. 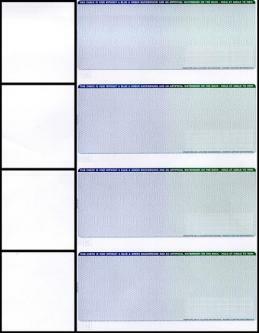 Premium Check Paper 4 Personal Checks per Page. Many other Corporate and Accounting check printing solutions. Please make sure to check your perforations below. 2 3/4" x 5 1/2" x 8 1/4"